Kids are back in school and in full learning mode, which typically means increasing workloads and homework, and long hours studying for looming exams. Too often, rising academic pressures also mean heavier backpacks—and potential back pain—as children transport textbooks, binders and papers back and forth between school and home. 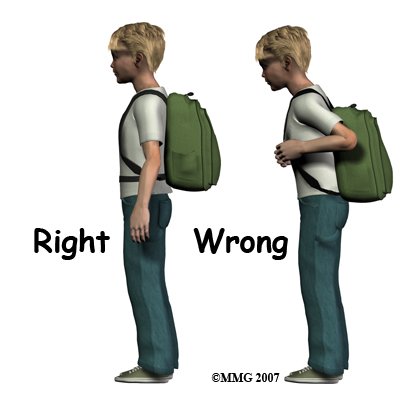 A backpack that is too heavy can pull your child’s spine into a backward-leaning position. Wearing it over one shoulder can cause your child to lean to one side. Either way, it can cause back, shoulder, or neck pain, or lead to bad posture. Narrow, unpadded straps can dig into the shoulders, leading to poor circulation. This can cause numbness, tingling, or weakness in the arms and hands. Overloaded, bulky backpacks make it hard for your child to judge distance, causing bumps, trips, and increasing the risk of falling, especially on stairs. According to the American Chiropractic Association (ACA), size matters. 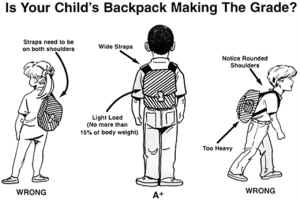 The backpack should never be wider or longer than your child’s torso, and the pack should not hang more than four inches below the waistline. The ACA also recommends that children never carry more than 10-15 percent of their body weight. Make sure your child’s backpack has two wide and padded shoulder straps, a cushioned back, and waist straps. Encourage children to use both shoulder straps and make sure the straps are tight. Organize supplies and books so that the heaviest items are closest to the center of the back and all compartments are used. Persuade children to stop at their lockers often so they’re not carrying all of their books throughout the day. 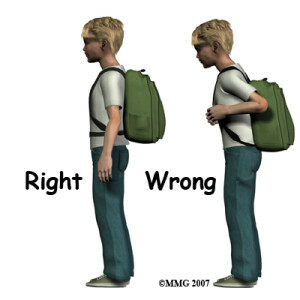 Remind children to bend using both knees when lifting a backpack. Remind children to not leave backpacks on the floor where others can trip over them, and not to swing them around where they may hit others. If your child complains about persistent back, shoulder, or neck pain, or suffers from poor posture, give us a call at (801)-893-1010.